The following information was provided by Dixie Gentry's daughter and granddaughter. Dixie was a trainee from the 6th class of 1944. 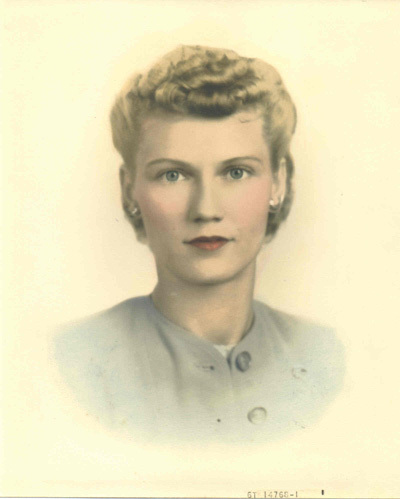 Michele Gentry, her daughter, who is currently living in Colombia, South America, recently reported that, "Dixie G. Gentry was born Dixie Gist (married Jefferson R. Gentry) December, 1916. After leaving WASPs served as air warden for Pasco County, Florida. " Michele also reported that, "My mother became interested in South America when she received a job offer to pilot cargo planes up and down the Magdalena River. The offer didn't pan out, mainly because when she read the fine print it notified her that in case of a forced landing or accident the company would not carry out any search for survivors!" This lead to Michele's interest in Columbia where she now teaches English as a second language at a Columbia university. Michele added this about her mother, "Dixie Gentry was a very adventurous woman - pilot, professor, co-founder of a bi-national cultural and language institute under the auspices of USIS and, after retirement, she took on the job of growing real Colombian coffee. When she retired as a Junior College instructor ... my mother moved to Colombia to be near us and the grand kids. Cristina Correal is one of those grand kids (5) and is rightly proud of her grandmother." Michele added that her mom, "Died in Colombia, South America, September, 1991. " Cristina Correal, daughter to Michele, had this to add, "She was my role model. Currently, I work for the Naval Air Warfare Center in continuation of my grandmother's dedication for this country." Cristina found her mother listed with the rest of her trainee classmates.